The Women Mean Business Conference in Mumbai saw a plethora of women from a variety of fields congregate at the Hyatt Regency to share their work experiences, discuss the challenges faced and draw up a blueprint for a future that is mapped heavily by technology and mobiles. In between speaking on the occasion to a motivated audience, Cherie Blair, founder, Cherie Blair Foundation for Women, and Kiran Mazumdar Shaw, chairperson, Biocon Ltd and member, National Innovation Council, spent time with Verve for an exclusive Q and A on the subjects closest to their heart – women and mobile technology and how we can adapt and influence a changing world. It’s been a year since the last Women Mean Business Conference in Mumbai. What changes do you see now? 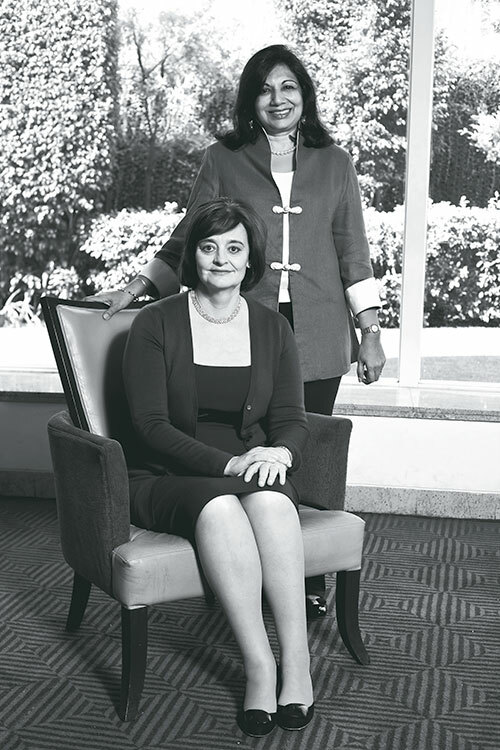 Cherie Blair: That was, honestly, a more introductory conference about the general aspects of women’s businesses in India, highlighting the tremendous successes and looking at the challenges. This year we are focusing specifically on ICT and how technology can help because, even in the span of just a year, technology has developed beyond imagination. Kiran Mazumdar Shaw: Women are amazing and I seriously think we are almost natural when it comes to experimenting with different technologies because we don’t have a pre-conditioned mindset as to what we should go ahead and do. CB: It’s probably because we are always running our families; we have to see what works and so we always have to change things, experiment. I got my computer when I was expecting my third child. I took it home, to stay in touch with my legal practice and learnt how to operate it. When my husband moved into 10 Downing Street, he had his infrastructure in place. I was able to continue with my own work only because of technological support. Men see what works and keep on doing it that way. KMS: Exactly. When my husband and I keep having these discussions, he says, no, take me through this slowly; I can’t think at your pace; I can’t think in all the various directions that you think. I need a very structured approach…. We just don’t experiment, we innovate a lot, so we use technology in ways that you would never imagine because we find solutions, and technology helps us to do that. Do you feel the network of women entrepreneurs has strengthened in the last couple of years? KMS: Hugely – if you look at just the National Entrepreneurship Network with whom I work from time to time. Today’s conference is really about how women can run businesses using technology from anywhere. CB: It makes all the difference in the world when you have a home to manage as well. In fact, I think that is one of the reasons why women are setting up more and more of their own businesses because the traditional structures in offices are less flexible. So women are responding to that by saying I am going to set up my own environment in which I can be a mother, be a wife and run my own successful business and to do that technology is such a powerful tool. What we are concentrating on in the NEN is the mentoring. Then you feel you’re not alone; you feel you’ve got someone to communicate with – and of course, technology is a part of that as well because you don’t have to physically be in the same room or even in the same town or the same village. You can use the internet and make your community and that’s one of the things that we are showcasing here. If you haven’t got someone next door to help, you may be able to find them using the internet. They may be thousands of miles away, but in virtual reality they are there for you. How do you see the support reaching out to women across the country? CB: When you don’t have access to computers, you can still use mobile phones; they are now using text messages in the vernacular scripts of 14 different languages. It’s a big challenge but it is not impossible with today’s technology. In terms of gender qualities, how is the Indian woman empowered as compared to the rest of the world? CB: Kiran is the prime example of that. Her story in itself is an inspirational one. All women are not the same in the world of men, but you do see that women have certain skills which lend themselves to the 21st century, when how strong you are physically isn’t necessarily the key to your success. It’s much more about how open you are to new ideas, how flexible you are; how savvy you are with using the new technology. One always sees that women have those skills of innovation, of experimentation, of bringing people together. Women are good team builders and that’s something that’s really important, I think, as a business skill today. What can motivate women to develop their own businesses? CB: Two things – first is develop the confidence. It’s interesting because I had done research which showed that if you put up a job that requires 10 competencies, a woman will say, ‘Oh, my god, I only have 9 out of the 10. I shouldn’t apply.’ A man is likely to think, ‘I have 6 out of the 10 so I am definitely qualified.’ The second thing is to look up to role models because the more women see other women succeeding, the more they will think that maybe they can actually do that. KMS: Conferences like this open the eyes of women to know that there are other women doing things – it’s not just a Kiran Mazumdar Shaw out there. What are the biggest challenges a woman faces if she wants to start her own business? CB: Credibility. I think the single most difficulty that women face right now is one of being taken seriously. It is all about getting out of a culture that sees a woman as a woman and does not see her as a potential business start. What is the biggest takeaway that a woman as an entrepreneur can take away from her participation here? CB: It’s about saying probably first of all, you are doing very well and that you can do even better if you use the technology well. KMS: At a conference I attended in Washington, this year, they were talking about how these social networking communities are great dipstick studies. Indra Nooyi spoke how if they want to have consumer feedback they don’t do any great market research. They put up their query on Facebook and get feedback instantly. The biggest lesson for me when I attend these conferences is that we cannot be very old-fashioned and set in our ways. Would you say that the ‘she economy’ in India is shining right now? KMS: I hate to use such phrases, but I certainly think that the ‘she economy’ the world over has been an overlooked emerging market. We really need to focus on and define what this ‘she economy’ is all about. It shouldn’t be only about cosmetics and this and that – it should be about how we tap into the huge market in a very intelligent way.